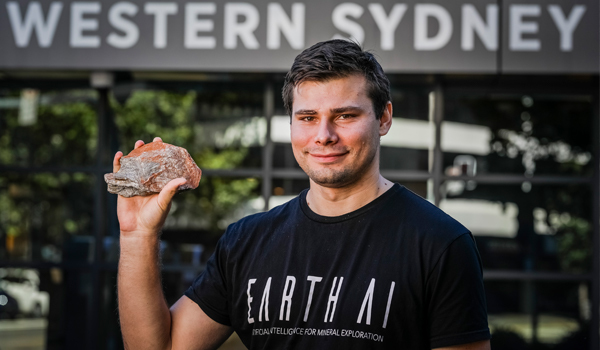 Roman Teslyuk, who began his career as a geologist in the Ukraine and Russia, is the co-founder of the Australian business Earth AI, which increases the accuracy of mining exploration. Roman was nominated for migration by the NSW Government and is the first person in Australia to receive a Business Innovation and Investment (Provisional) visa (subclass 188) Entrepreneur Stream visa. Roman moved to Sydney, the NSW capital, in 2015. His success in Australia began when the University of Sydney (USYD) was the first to respond to his worldwide search for a place as a PhD candidate. In mid-2016, USYD invited Roman to participate in the ‘Inventing the Future’ program. This unique, cross-disciplinary program involving postgraduate and research students inspired Roman to develop an innovative method of mineral exploration. With the help of his Ukraine-based IT specialist friend, Ihor Herechko, Roman developed a prototype of data analysis software that uses remote sensing and geophysical and geochemical data to create precise geological maps and predict where to find new mineral deposits. This innovative, web-based software aims to increase the accuracy and success rate of geological mapping and reduce the risk of mining exploration. Roman successfully pitched his idea at the International Mining and Resources Conference in Melbourne and secured funding from USYD’s accelerator program, INCUBATE. Buoyed by these achievements, Roman registered Earth AI as an Australian business. He contacted Australian Securities Exchange-listed companies with a focus on mining, and secured ActivEX Limited as his first trial customer. When their initial expectations were exceeded, ActivEX shared their data with Roman for input into the software and agreed to an ongoing subscription. Earth AI sells their software on a subscription basis to mineral exploration companies. Within a few months, 10 new trial customers had signed up. In July 2017, Roman raised $500,000 in venture capital funding and registered Earth AI as an Australian business, in partnership with Ihor. Earth AI would sell their software on a subscription basis to mineral exploration companies. After juggling his PhD requirements and the growth of his business for some time, which now has 70 trial customers, Roman has deferred his PhD. Earth AI now has 70 customers on trial and paid contracts and has expanded its services and by purchasing mobile field base equipment for checking predictions and performing field work for customers. Currently, Earth AI is based at the Western Sydney University Launch Pad in Parramatta, which is a NSW Government initiative that supports business by providing modern but low-cost serviced office and co-working space, specialist business advice, mentoring, events, networking, training and education. In addition to Roman and Ihor, Earth AI has seven full-time employees in NSW, comprising two field teams. Roman lives in Olympic Park with his wife, Khrystna. On arrival in Australia, the couple had only one acquaintance living in Sydney and knew no one else, but Roman finds people in NSW are friendly and it has been easy to make friends. Roman likes the natural beauty of NSW and the diversity of Sydney. He was also happy to discover Sydneysiders do not discriminate against people from other countries or those who speak English with an accent. Roman’s long-term goal is for Earth AI’s tool to be applied anywhere in Australia, and eventually to have international capabilities. He would also like to see automatic data validation replace manual fieldwork. In the short-term, Roman and Earth AI’s focus is to continue enabling companies to make a substantial mineral discoveries and to continuing to improve the software and system delivery. Roman says that the best part of his work is developing something new that has never been done before.